IIPH Blog | Fun Ways to Celebrate Eid! Fun Ways to Celebrate Eid! Takbeer! Allahu Akbar! Eid is just around the corner, and it is time to celebrate! In being serious about fulfilling Allah’s commands, Muslims sometimes end up giving the impression, particularly to small children, that Islam is not any fun at all. Nothing could be further from the truth. Allah has created this world for our enjoyment, and the two Eids are our days to shine – to celebrate, be merry, and to have lots of fun. A complete win-win situation, where we get to have fun and get rewarded for it too because we are doing it with the remembrance of Allah! Living in today’s age, our children witness all kinds of celebrations such as Christmas, Thanksgiving, birthdays, anniversaries, Valentine’s Day, and so on, which are celebrated with great gusto. Eid does not come with as much fanfare sadly, and this is where Muslim parents need to step in and make Eid a day to remember! Here are some ideas to make Eid the number one holiday in your house! The countdown to Eid can be as much fun as the Eid itself. It not only builds up the excitement, but makes Eid extra special as well. Time to wrap up the Eid gifts. Don’t do a quick wrap-up job. Make each gift special by personalizing each wrap. Wrap each gift in newspaper and then paint, sponge paint, paste stickers, or decorate it with ribbons to make it extra special. Make sure the gifts you have bought for your kids are big gifts. The kind children get for other occasions, or even bigger! Show them that Eid is more special than any other holiday. Encourage your family to get gifts for your children on Eid rather than on other occasions. A small note: Don’t forget to buy gifts for your own parents and help your kids to buy gifts for you! Eid is for the elders as much as it is for the little ones. Eid is also for the poor. Buy gifts to give out on the way back from the mosque on Eid day, and if you have servants who work for you, do get gifts for them and their children. Remember to pile your gifts at a central place in the house where your kids can see them as a reminder for the coming Eid! Pin the Crescent: The game involves pinning the crescent on the mosque blindfolded instead of the tail on the donkey. Preparation: Make the crescent and the mosque on a piece of chart paper. Make sure you have a thumb tack. Musical Chairs: Played with clapping or the duff instead of music, the person to claim the last chair gets to cut the Eid cake! Preparation: Arrange a duff or make one, have enough chairs, and don’t forget the Eid cake! Pass the Eid Parcel: Make the parcel by wrapping newspaper around small gifts layer by layer. The parcel is passed around the circle while someone plays the duff (or claps). When the ‘music’ stops, the person who ends up with the parcel peels back the first layer to claim the gift. Preparation: Make the parcel with fun little gifts like stationery or candy. Charades, treasure hunt, Pictionary, sack races, and tossing the rings are also games that can be adapted for the occasion. Use these two days to decide which games you’d like to play! If other types of parties can have a theme, why not Eid? It doesn’t have to be all about crescents and mosques! Choose a theme you like. There are lots of printables online to download and print for instance banners, buntings, straw flags, stickers, and so on to, make your day extra special. Choose a colour theme that’s different and festive. These are the two days to get your theme sorted out, printed, and stored to be taken out on the last day. Go and buy some fairy lights (if you don’t already have them!) to make your house all twinkly on the big day! Time to make Eid cards! There isn’t much to say here. Kids know what to do! If you have close ones who live in different countries, make their cards first, and post them! Imagine the joy they will feel to get a handmade card on Eid day, when they are far away from their family. Time to chalk out the menu. Get your kids involved in choosing what special foods they want on Eid day: pizza, cakes, pasta, chocolate fountains, or whatever takes their fancy! Now is the time to pre-cook some of the things so that it’s just a matter of heating or a final round of baking before serving. Eid is tomorrow! Time to break out the Eid decorations you have made and the lights you have bought. Blow up balloons, set up the table, put up the streamers, and bake that cake! Don’t forget to lay out your Eid clothes at night too! Eid surprise- the extra gift! So far, your children were involved in everything you were doing. But there’s nothing more exciting than a surprise! Buy a small gift, something you know your child will really like, and have it ready to give when you sight the moon – a small token for appreciating their hard work in Ramadan. Don’t forget to recite the supplication for sighting the moon. In all the excitement, don’t forget to follow the Sunnahs of Eid! The Sunnahs adds that extra specialness to this holiday that none of the other holidays have, Subhan’Allah. Let your children remember through this that even while we have fun, we don’t forget Allah and His Prophet (sa)! 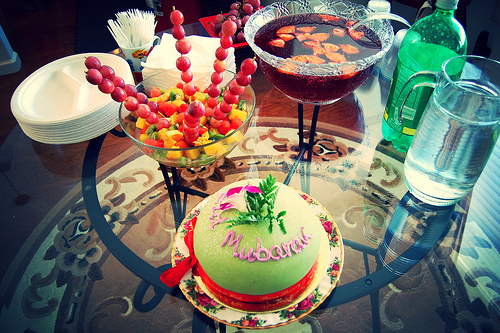 Break the fast: Eat something sweet before heading out for the Salah (prayer). Wear your new clothes, and look your best. Go for Eid Salah as a family. Take one route to the mosque and back from another. Don’t forget to hand out the gifts you wrapped for the poor! Hope you have a blast on Eid this year!